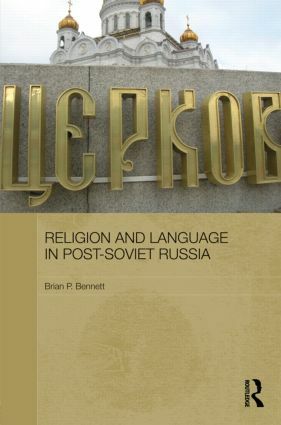 "One of the many virtues of Brian Bennet’s book is that he views the many changes in Russian society through a rather neglected perspective: the prism of language… The book is an interesting and well written contribution to the literature on religious (and socio-linguistic) developments in present-day Russia." -- Annika Hvithamar, University of Southern Denmark, 2012. "Brian Bennett’s sound academic research is copious and abounds in expressive empirical details… A well-balanced and thoroughly documented style, pinpointing a tremendously rich and revealing aspect of a culture in flux and drawing attention to the linguistic dilemmas behind the society’s quest for identity. "- Alexander Agadjanian; Slavic Review, Vol. 71, No. 4 (WINTER 2012). "Brian Bennett offers a compelling, in-depth study that reminds us that the very language that serves as one of the defining visual features of the institution has experienced a long and contentious history of politicization… ln all. Religion and Language in Post-Soviet Russia offers an outstandingly researched examination ofthe contemporary cultural history of Church language, thoroughly grounded in the history of both the Church and the language." Michael S. Gorham, University of Florida; Slavic and East European Journal 2013. Brian P. Bennett is Associate Professor of Religious Studies at Niagara University, USA.